The ransomware has a manual switch that allows for more sophisticated attacks. Appearing only last week, the Keypass ransomware has already taken hundreds of devices hostage. Mainly infecting users Brazil and Vietnam, the software has spread worldwide and infected devices have been found in South America, Africa, Europe, the Middle East and Asia. While ransomware attacks happen on a virtually daily basis, this attack is special as it provides insights on the future of attacks. Kaspersky Lab analyzed the ransomware and found that a switch that allows attackers to take manual control of an infected device. Essentially this shows that attackers will be able to launch more invasive attack, as cyber security analysts we all need to be on the lookout for this. As of right now there is no free version to decrypt your files for free. The best way to protect yourself is ensuring that you do not fall victim to it in the first place. For large organizations, make sure that you make consistent backups, so you can easily revert your network and bypass the need to pay the ransom. 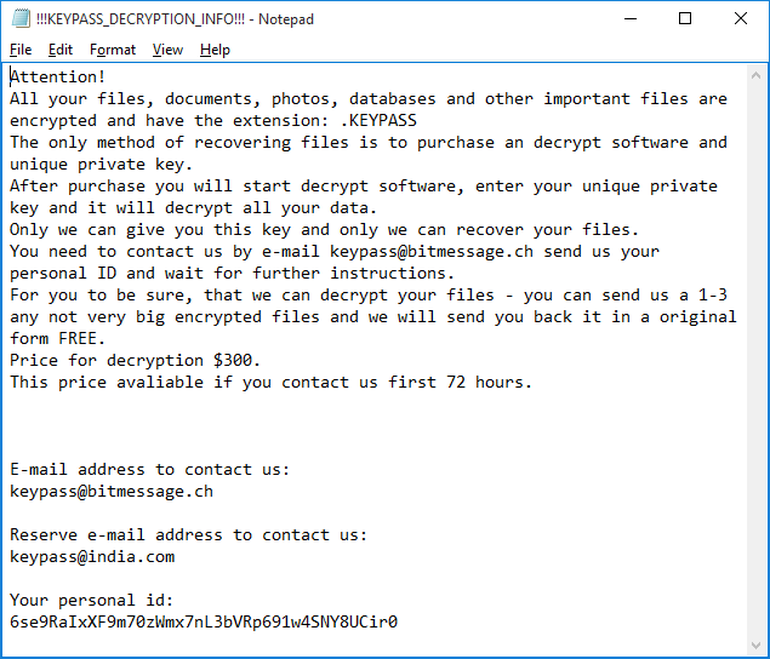 In general, never pay cybercriminals for ransomware decryption keys. To protect your organization from similar attacks make sure to reach out and see how we can solve your needs.